Good morning and welcome to Monday Blogs. This month, we’re focusing on paranormal books. There will be a lot of visitors making an appearance but on Sundays and Tuesdays, this blog will be all about things that go bump in the night! In the not too distant future a man can lose his job over a sandwich. A bizarre chain of events involving a man called Chimp, a moist blanket, and a dwindling box of belongings, leads Leander to work in the nightmarish employment of Total Entertainment. You are your job. And Leander soon finds his job very confusing. And very, very, scary. When he no longer trusts the people he works for, the people he works with, or indeed, his own mind, his grip on just about everything starts to loosen. 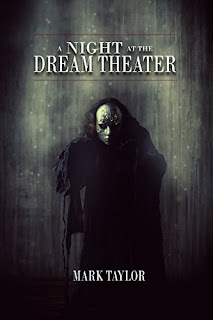 A Night at the Dream Theater is a horror, a comedy, brimming with science fiction, and slightly strange.